← The First Step toward “20 in Plenty”? It was a real pleasure to open the autumn 2013 edition (Vol. 12, No. 1) of “Bicycle Quarterly” and find all the artwork (including the few ads) in full color. “Bicycle Quarterly” is a labor of love of its founder and editor, Jan Heine. If you want technical articles and unrestrained reviews, this is the mag for you. There is almost a glut of non-racing bicycle journals on the market – “Momentum,” “Bicycle Quarterly,” “Bicycle Times,” “Urban Velo,” and “Bicycling.” Part of the market will shake out with edge going to those that have the editorial courage to write independent equipment coverage. From at least one of the aforementioned journals, one would think that every light, shifter, frame, tire, etc. was a flawless divine creation in which no possible improvement could be envisioned. 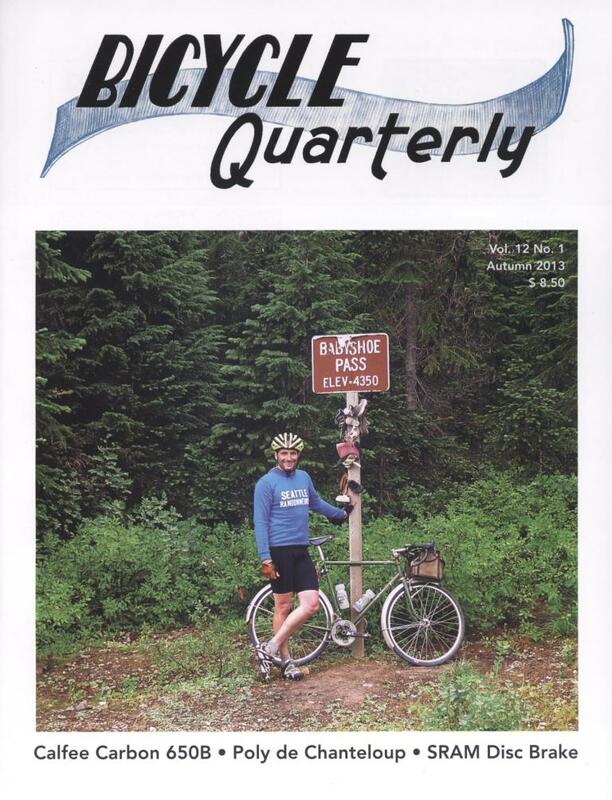 While recognizing that the bicycle magazines have to survive within the realities of ad revenues and their dependence on the manufactures for test equipment, “Bicycle Quarterly” stands out. Not only are the tests well documented and based on (in some cases) some sophisticated test modalities but the reader gets the impression that the review is the “whole truth and nothing but the truth. Interestingly, “Bicycle Quarterly” invites the manufacturer to comment on the test/review and publishes the reactions along with the review.